« I’m Trying Not to Brag. 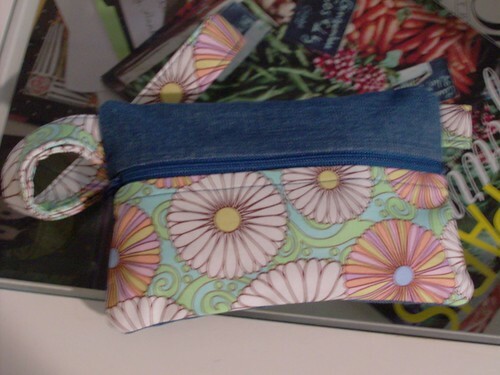 And yes, it’s another wristlet. 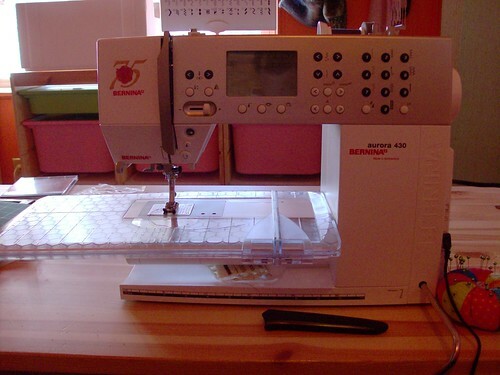 My brand-new, picked-it-up-today Bernina Aurora 430. It is a thing of beauty, and I am completely in love. I’m in negotiations with hubby to modify the Ikea desk on which it sits so that the machine will sit down and the desk surface will be even with the sewing surface. We’re still trying to figure out how to do that. I’d like to modify the desk I already have rather than buying a new one. I’ll have to get more pictures of the rest of the crew. They just aren’t as photogenic as some other people‘s animals. 😀 Have a good one! September 17th, 2008 | Tags: Beasts, Sewing | Category: Misc. Woohoo! I love the denim. I think you’re going to sew more than I have if you keep this up!! very cute bag. 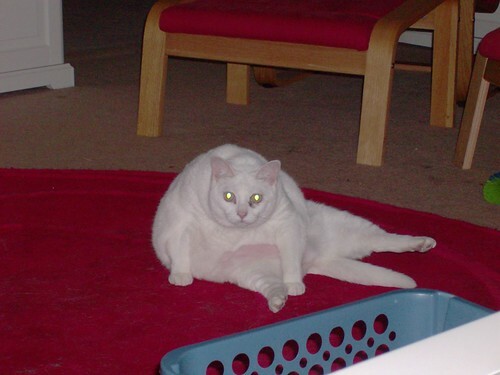 Love it when cats just plop down and start licking themselves – no shame at all! TWO piccies of my Rowena? Wow! I love the new hardware. Good times! LOL! So who gets to sit next to her in the gold bikini – you or Kris? Another fellow Bernina owner! You’ll love it! I’m emailing you some info! Yay, Berninas!!! I’m so glad you found a machine that you love! Oooh new toy! I love it! I need to unpack my machine and start sewing again soon! I keep seeing people sewing on their blogs and want to sew too! What a beaut! Someday . . . line when I get a J.O.B., I’ll be able to step up fom my Bernette 60.